ST. CLOUD, Minn. -- Standing in the same room that almost 25 years ago housed the phone bank for callers to report tips about the Jacob Wetterling abduction, Patty Wetterling on Tuesday again asked for help finding her son. 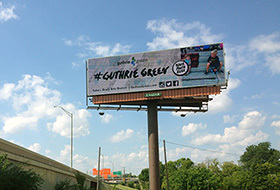 This time it was part of a billboard campaign that will see six billboards, donated by Lamar Advertising Company, placed around the St. Cloud area. 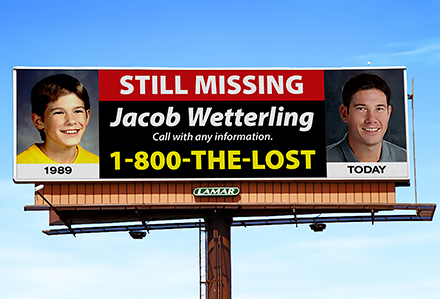 Those billboards will have Jacob's picture at the time he was abducted, an age-enhanced picture of what Jacob might look like today and a phone number to report tips, 800-THE-LOST. New billboards have been unveiled Oct. 14 near St. Joseph, Minn., where 11-year-old Jacob Wetterling was abducted 25 years ago. Lamar Advertising Company donated the billboard space to support the continuing search for Jacob. "This was part of what was the command center, with all of the phone banks for people to call with information," Patty Wetterling said. "And that is our primary message today, we're still asking people to call." Jacob was abducted Oct. 22, 1989, while biking home from the store with his brother and a friend. He hasn't been seen or heard from since. The announcement of the billboard campaign comes eight days before the 25th anniversary of Jacob's abduction. The billboards will be up through the end of the month. The case has generated more than 50,000 leads, said Stearns County Sheriff John Sanner, including many when the case was featured recently on CNN's program "The Hunt," with John Walsh. "If we get tips today, we treat this case as if it happened yesterday," Sanner said. "We'll treat it with the same energy and enthusiasm as if it was 1 day old, not 25 years old. We will continue to do that." And statistics from the National Center for Missing and Exploited Children shows that children can be found after being missing for years. From 2009-13, more than 160 missing kids were found who had been missing 11 to 20 years, said John Ryan, president and CEO of the center. In the same time, 42 missing children were found who had been missing for more than 20 years, Ryan said. It's that hope that buoys the Wetterlings. Jerry Wetterling joked at the news conference Tuesday that he's the one who usually listens while Patty is the one who speaks at events like these. But he took to the podium to encourage others to listen as well. "I would like to urge the public to listen," Jerry Wetterling said. "Listen. Listen to something that is said innocently at a cafe ... something you hear that when you listen inside of your gut didn't feel right about a situation. Think back, respond." And call law enforcement with anything that you think might help. "We know someone has information that can finally give Patty and Jerry answers they deserve," Ryan said. The out-of-home medium reaches nearly 90 percent of U.S. adults. 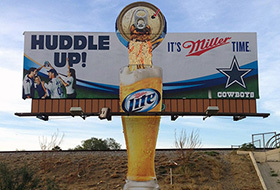 Outdoor advertising commands a small but growing slice of total media spending in the U.S. Here are five facts about out-of-home as a medium.